Gdansk is Poland's major historic trading port, and a good place to visit if you want a holiday filled with visual delights. The best thing about a holiday in Gdansk is strolling the streets of the Old Town to admire the beautiful historic buildings, which were sympathetically restored after being laid to waste by bombing raids during World War II. Gdansk also has a lively waterfront area where tourists congregate in pavement cafes and excellent restaurants, and a number of other worthy attractions including Oliwa Cathedral, St Mary's Church, Oliwa Park and the quaint and colourful Mariacka Lane, which is lined with 17th-century houses. Gdansk forms the Tri-City complex with the modern port of Gdynia and the popular coastal resort town of Sopot, Poland's best spot for a beach holiday. The starting point for the German invasion of Poland was the Westerplatte peninsula, where some of the barracks and guard houses of the courageous Polish defensive force still stand and a huge memorial has been built in their honour. 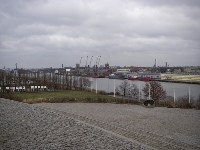 Westerplatte, which can be reached by boat, car or bicycle, is now one of the region's most popular tourist attractions. Summer is the best time to travel to Gdansk, when the weather is warm (sometimes even hot), although it is still a good idea to take a jumper for the cool evenings. Winters are best avoided as they can be frigid and wet and the sun is seldom seen. We are looking for contributors for our Gdansk travel guide. If you are a local, a regular traveller to Gdansk or a travel professional with time to contribute and answer occasional forum questions, please contact us.